It’s nothing new to see electronic music festivals and events with less than 10% of it’s performers being female and many ask why this is. Most believe (including those who book these events) that it’s because there just aren’t enough women out there making music and would like to leave it at that. The Female Pressure network, dedicated to raising the visibility of women in electronic arts and established 15 years ago with over 1300 female members, takes issue with this argument. 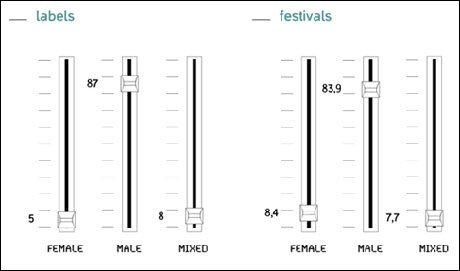 We decided to do an experiment, and count the male / female ratio of many of the most visible electronic festivals and record labels, and this is what we found. The results of the study have been gaining media attention and sparking conversation. It shows that even 15 years after the establishment of such a large network (over 1300) of female artists that we are still only being given 10% representation at these many times publicly funded festivals. These numbers showcase the fact that the creative potential of female artists are being overlooked. Something has to be done to raise the visibility of the work of female artists, for the sake of presenting an accurate view of the social reality, and for the sake of inspiring future generations of artists. In response to these disappointing numbers, the Female Pressure collective decided to create a music festival that might address the underlying dynamics of imbalance, and begin an open dialog that addresses how we can all develop solutions for a more gender-sensitive music industry. Visit the Perspectives Festival Blog for interviews, podcasts, and more info on the conference.